Inquiry-based learning is grounded on the philosophy of John Dewey , who believed that education starts with the inquisitiveness of the learner, and that learning and researching are corresponding activities. Both activities are focused on cognitive processes. Since the 1970ies, inquiry-based learning and assessment is a main didactical principle of teaching in higher education and documented in a number of papers , , . Inquiry-based learning is a student-centered active learning approach, where the students are part of the whole research process. Learners complete different phases of the research process . Inquiry-based learning activities start with the development of a research question followed by finding adequate research methods and investigating different solutions. On basis of the gathered information, students create new knowledge. The discussion of discoveries and experiences is an essential part of the learning process. At the end of the process, the findings are comprehensibly documented and presented for third parties. Inquiry-based learning encourages a hands-on approach where students practice scientific methods. The documentation and reflection on the personal learning pathway is part of the learning process. Fig. 1 shows Kolb´s experiential learning cycle synchronised with a typical research cycle that is basis for the inquiry-based learning model. It regards learning as an interaction of several different activities on the part of the learners, such as dealing with an authentic learning item in a concrete and direct way, reflection, the development of a personal net of knowledge by means of abstract conceptualization and the use of this theoretical knowledge for planning further learning activities. 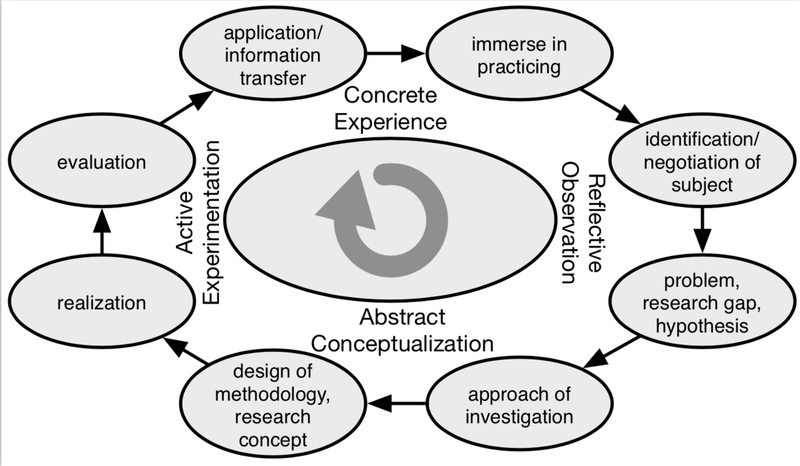 Kolb´s  model of an experience based learning model is built upon the idea that learning preferences can be described along two continuums: active experimentation vs. reflective observation and abstract conceptualization vs. concrete experience. These four elements are at the centre of an idealised learning cycle or spiral where learners touch all the bases. The research and the learning process starts with observation of problems in the real world and the concrete experience, the students are irritated by a situation or an experience. The defining of questions or problems is part two of the cycle (reflective observation) and ends with the formulation of research questions or hypothesis. The abstract conceptualisation is used to develop a research concept and design. The developed concepts will be verified during active experimentation, and new knowledge will be created. From this findings new learning and research cycles start. The steps in the research process are connected with the learning steps in the learning process to acquire research competencies and professional expertise. This is the basic principle for developing a learning scenario that connects the two processes. In our scenario the learning activities start by developing relevant and feasible research questions that fit into the general topic “Ethical Questions of Digital Communication”. Appropriate research methods are then developed and data is gathered. As an incentive, the best papers can be presented at the Cross Media conference “Think Cross – Change Media” (#TCCM) and be published in the conference proceedings. 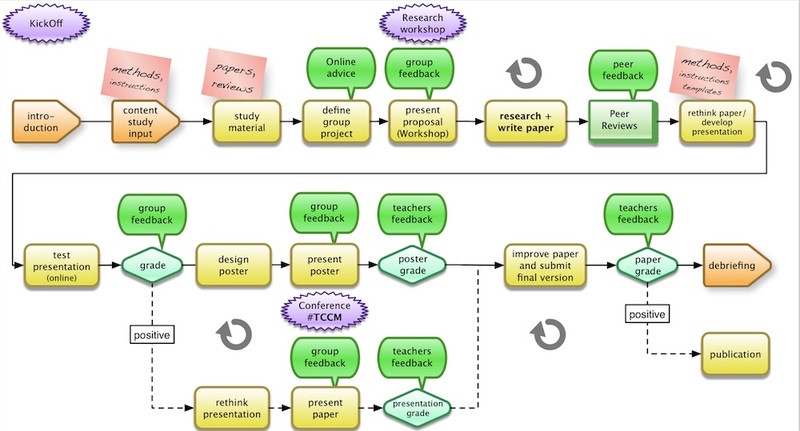 During all stages of the research process, feedback is provided by both peers and teachers. This peer review is an essential part of the learning and forms the basis for selecting the papers for the conference.